CeeLo Green first entered the scene as part of the Atlanta hip hop group Goodie Mob which had a large hand in the Dirty South movement of the 1990s. Green left the group after their third album in 1999 and started his solo career. That year he sang on "Do You Like the Way" along with Lauryn Hill on Santana's multi-platinum Supernatural album. Brian Joseph Burton, better known by his stage name Danger Mouse, has produced albums for a number of hip hop and rock artists, including Gorillaz' Demon Days, and The Black Keys' Attack & Release, El Camino, and Turn Blue. He received international attention for his mash-up The Grey Album, which blended the a cappella edition of Jay-Z's The Black Album with samples from The Beatles' White Album. The duo first met while Green was on a tour for which Danger Mouse happened to be the DJ. They became musical partners and worked together on the songs that would become St. Elsewhere; prior to the release of that album they collaborated on the songs "What You Sittin' On?" for Lex Records in 2004, and "Benzie Box" from the Danger Doom album The Mouse and the Mask in 2005. In 2006, Sanjiv Bhattacharya interviewed the duo for The Guardian and asked about where their band name came from, to which Green replied: "You ask me why we're called Gnarls Barkley and I'm asking you 'why not? '...The name Gnarls Barkley isn't anchored down. It's a drifter. A High Plains drifter, I might add". Danger Mouse said: "There's no story behind it...The name doesn't have anything to do with anything". Although many people believe that their name has something to do with former NBA player Charles Barkley; when Sanjiv asked them about it, Danger Mouse replied: "Nope. It's just like everything else on this record. There was no conscious decision about stuff". According to a Billboard article: "Burton and CeeLo have been cagey about what the name of the act means, and each live performance is an opportunity to play dress-up as tennis players, astronauts and chefs, among many other get-ups. The costuming extends to photo shoots, as Burton and Cee Lo would rather impersonate characters from such films as Back to the Future or Wayne's World. They also have dressed up as characters from films A Clockwork Orange and Napoleon Dynamite. That is that electric industrial Euro soul, that's what I call it... if I can call it anything. It truly is shapeless and formless. My style and my approach is still water, and it runs so deep. So, with that project I got a chance to be a lil' zany, of course a continuation of eccentricity, abstract and vague, and all of those wonderful things that make art exactly what it is. And that's subject to interpretation. As far as the artiste himself, it does cater to and extend the legacy of Cee Lo Green, and showcase the diversity and range and intention of Cee Lo Green. It is a great project that I'm very, very proud of. Downtown/Atlantic in the United States and Warners Bros. Records in the United Kingdom signed the band after several songs, including "Crazy", were played for them by Danger Mouse's management company Waxploitation. "Crazy" was released as their first single on April 3, 2006, preceded by its release as digital download and 12" vinyl record single in March 2006. It gained some of its popularity due to its use on primetime BBC Radio 1 DJ Zane Lowe's television advert, and it was also made Record of the Week by Ken Bruce of BBC Radio 2, Scott Mills and Jo Whiley of BBC Radio 1 as well as being made 'Weekend Anthem' by DJ Spoony and Sara Cox (also of Radio 1). In an interview with journalist Stephen Mooallem about their single "Crazy", Mooallem asked the duo, "Is it true that Cee-Lo recorded the vocals for "Crazy" in just one take?" to which Danger Mouse replied, "Yeah. He had the words written on paper, and what you hear on the album was the first time he ever tried singing it. He went in and gave it a shot, really just to see what it would sound like. We just kept it because it sounded great." The song was, in addition, considered by the duo to be an "independent joint venture," paid for entirely "out-of-pocket." Catapulting the two into stardom, the single was primarily responsible for their success, as they "didn't even have a formal deal in place" until the song hit No. 1. In the United Kingdom, "Crazy" became the first ever single to top the UK Singles Chart purely on download sales as it was released online a week before it was released as a CD single. It is also the first single to top the UK Singles Chart for nine weeks consecutively since 1994 when Wet Wet Wet's "Love Is All Around" was number one for fifteen weeks (the last song to spend exactly nine weeks on top was "Two Tribes" by Frankie Goes to Hollywood in 1984). It has also equaled the Queen 1975 classic "Bohemian Rhapsody", which also topped the UK Singles Chart for nine weeks. 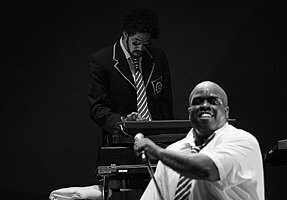 Gnarls Barkley announced that as the record had spent its ninth week at number one, it was to be deleted as a vinyl/CD listing from May 28, 2006, so people will "remember the song fondly and not get sick of it". "Crazy" is also the longest number-one on the UK Official Download Chart with its stay lasting eleven consecutive weeks. In late 2009 the song was voted as the best song of the decade by Rolling Stone magazine. The group released their debut album, St. Elsewhere, on April 24, 2006, in the United Kingdom and on May 9, 2006, in their native United States. For their American television debut on Late Night with Conan O'Brien, May 24, 2006, the band performed "Crazy". They performed along with Christina Aguilera, AFI, and Wolfmother at the MTV Movie Awards 2006 on June 8, 2006. They were dressed as characters from the film series Star Wars. Rebel Alliance pilots, Imperial officers, Stormtroopers, Chewbacca, Jango Fett, Obi-Wan, with Cee-Lo singing as an unmasked Darth Vader. In October 2006, Gnarls Barkley recorded a live session for Live from Abbey Road at Abbey Road Studios. St. Elsewhere has been certified Platinum by the RIAA for selling over 1,000,000 albums in the United States. A limited edition deluxe package of St. Elsewhere was released on November 7, 2006. The CD+DVD package includes a 92-page booklet, four music videos and bonus songs from live performance. St. Elsewhere was nominated for four Grammy Awards in 2007 including for Record of the Year, and Album of the Year, winning two of them for Best Alternate Music Album, and Best Urban/Alternate Performance for "Crazy". From January until March 2007, they toured with the Red Hot Chili Peppers through the U.S. They did a collaborative short film in both the Spring of 2006 and 2007 with the international TV series Kung Faux which airs heavily on Channel V around the world, and they also toured Australia in March and April 2007 as part of the Channel V Festival. In early March 2008, the duo's second album, The Odd Couple, was leaked over the internet prompting the duo to push the release date up from April 8. In an interview with Entertainment Magazine, Danger Mouse said that he "knew it [the leak] was coming...every day, I expected to get a call saying it leaked, and eventually I got a call saying it leaked." On March 18, 2008, the album became available via download on the iTunes Store and Amazon MP3. Hard copies of the album were released on March 25. Prior to its official release, Green spoke to the album's anti-formulaic qualities, noting bluntly that "there's no formula to it," and that to expect the same wild success of St. Elsewhere is to neglect the ever-present "risk factor in any artistic endeavor." He called it something of an "act of faith" – a true, earnest attempt to create and disseminate a piece of art to those who would seek out its conception. They appeared as the musical guest on the April 12, 2008 episode of NBC's Saturday Night Live. They were supposed to be in a Digital Short parodying amateur music videos according to the scrolled text but only appeared in the singing performances of the live broadcast. On November 11, 2008, they released an EP, Who's Gonna Save My Soul, featuring four versions of the song which originally appeared on The Odd Couple, along with a live version of "Neighbors" and a previously unreleased song, "Mystery Man." A music video for "Mystery Man" was directed by Walter Robot and premiered on Yahoo! Music. 2009 Rolling Stone 100 Best Songs of the Decade – No. 1 "Crazy"
^ "Gnarls Barkley and a Soulful Predecessor". NPR. April 17, 2008. Retrieved March 20, 2016. ^ Hermes, Will (March 25, 2008). "Gnarls Barkley, 'The Odd Couple'". Spin. Retrieved April 11, 2015. ^ Locker, Melissa (December 23, 2014). "Gnarls Barkley To Reunite in 2014". Time. Retrieved April 11, 2015. ^ a b "Gnarls Barkley Receives RIAA Platinum Certification – DJBooth". DJBooth.net. Retrieved March 19, 2016. ^ "New (Leaked) Music: Gnarls Barkley – The Odd Couple". Mother Jones. Retrieved March 19, 2016. ^ a b c Bhattacharya, Sanjiv (April 23, 2006). "Plain crazy". The Guardian. ISSN 0261-3077. Retrieved March 20, 2016. ^ "Interviews". ThickOnline.com. July 31, 2006. Retrieved May 9, 2011. ^ "Interview – Josh Deutsch, A&R for Gnarls Barkley (No.1 UK) – Sep 04, 2006". HitQuarters. 2006. Retrieved November 9, 2006. ^ "Off Campus Access". web.b.ebscohost.com.mctproxy.mnpals.net. Retrieved March 23, 2016. ^ "Off Campus Access". web.a.ebscohost.com.mctproxy.mnpals.net. Retrieved April 1, 2016. ^ "Gnarls Go Out On Top". The Daily Record. Retrieved May 28, 2006. ^ "100 Best Songs of the Decade". December 9, 2009. ^ Carroll, Larry (May 8, 2006). "2007 Movie Awards Story | Justin, Luda To Appear At Movie Awards – Show Story | Headlines". MTV. Retrieved December 19, 2012. ^ "GRAMMY Rewind: 49th Annual GRAMMY Awards". The GRAMMYs. Retrieved March 19, 2016. ^ "NEWS". Redhotchilipeppers.com. July 24, 2010. Retrieved May 9, 2011. ^ "Off Campus Access". web.b.ebscohost.com.mctproxy.mnpals.net. Retrieved March 22, 2016. ^ Cohen, Jonathan (October 22, 2008). "Gnarls Barkley Bares Its 'Soul' On New EP". Billboard. Retrieved October 28, 2008. ^ "I'm a granddad at 35,' Gnarls Barkley star Cee Lo Green celebrates daughter's new baby". December 3, 2010. Retrieved July 17, 2015. Cee Lo, who is nominated for record and song of the year at the 2011 Grammys, told Handler he was planning to record a new album with his hip hop group Goodie Mob, and then start on a new record with Gnarls Barkley. ^ "Cee-Lo Green to Release Three Projects, Announces Goodie Mob's Album Release Date". Billboard. Retrieved November 7, 2013. ^ "CeeLo Green is "Cookin Up" a "Prequel" to Gnarls Barkley's Brand New Album (Exclusive)". DJBooth.net. ^ Todd Leopold CNN (February 12, 2007). "CNN.com, February 11, 2007". Edition.cnn.com. Retrieved December 19, 2012. Wikimedia Commons has media related to Gnarls Barkley.